August 27 is a holiday for all of you banana lovers out there. The National Banana Lovers Day is the day to celebrate the most popular fruit in the United States and one of the most popular fruits in the world. Bananas are edible fruit produced by several kind of plants in the genus Musa. Contrary to a common misconception, bananas are not trees but large herbaceous plants. Bananas are rich in dietary fiber and sugars. They are an excellent source of vitamin B6. They also contain other B vitamins, vitamin C, potassium, magnesium, phosphorus, sodium, zinc, iron, and manganese. Bananas are extensively used in cooking. There are two main types of bananas. 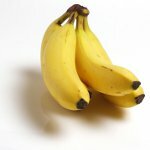 Dessert bananas, often referred to as simply bananas, can be eaten raw. They are either consumed by themselves or used for making pastry and desserts. Plantains, or cooking plantains, are consumed only after cooking. They can be fried, grilled, baked, boiled, and steamed. There are a lot of dishes that include bananas as one of the primary ingredients. Some of them are: banana bread, banana pudding, banana split, banana cream pie, banana muffins, Bananas Foster, plantain soup. Banana chips are a popular snack food. To celebrate the National Banana Lovers Day, cook any of these dishes. If you don't feel like cooking, just eat a couple of bananas which are both tasty and useful.